Mr. Ibrahim Khalil Gaga graduated from the Bayero University, Kano 20 years ago with a LLB a Degree in Law and BL from the prestigious Nigerian Law School. He obtained his Master of Laws from the Lagos State University, Ojo, Lagos in 2002. He also possess a Post graduate Diploma in Management from the National Open University. In the past 2 decades, Ibrahim obtained wide range of experience ranging from private legal practice to the Banking Sector. He cut his teeth in private practice with the law firm of Ikiebe & Co.in Lagos. 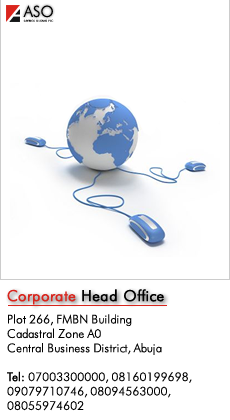 After Legal practice, Ibrahim worked with Liberty Bank Plc, Pacific Bank Limited, MBC International Bank Limited, First Bank of Nigeria Plc, Fidelity Bank Plc before joining ASO Savings & Loans Plc as the Head, Legal Services in May 2011 with experience ranging from Litigation, Recovery, security documentation, Risk Administration and Company Secretarial Practice. At Fidelity Bank Plc Ibrahim was involved in the documentation for the first Independent Power Project between Lagos State/ Island Power Limited/Fidelity Bank Plc, the First Canning Industry in West Africa located at Agbara Ogun State for GZ Industries Limited/Fidelity Bank Plc, for the Legal Documentation in the Syndication of N10 Billion Food Concepts (Owners of Chicken Republic) Syndication facility, for Legal Documentation in the Syndication for $ 1.2 Billion MTN Nigeria Syndication facility,for the Legal Documentation in the Syndication for $ 650 Million and N 8.2 Billion Etisalat Nigeria Syndication facility. 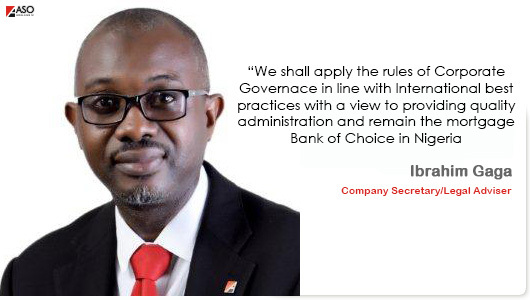 Ibrahim also attended courses which includes inter alia, on Housing Finance in Sub- Saharan Africa organized by the University of Cape town in South Africa, Project Finance Master Class by Jeff’ & O’brien and Managing Compliance & Risk at the Lagos Business School. Ibrahim joined ASO Savings and Loans in May 2011 as the Head, Legal Services but is presently the Company Secretary/ Legal Adviser.